Light from Almo Nature HFC is a food supplement for cats. This food is suitable for overweight cats, cats with heart disease or diabetes and cats that have been neutered. Please note The name of this product has been changed from 'Classic' to 'HFC'. The packaging will also change. Cats that are overweight, have heart disease or diabetes, or cats that have been neutered, need a lower energy supply. For these cats, there is Almo Nature HFC - Light. The food contains fresh, natural ingredients that were intended for human consumption, but are now used in this pet food. Almo Nature HFC - Light it contains no preservatives or colourings. 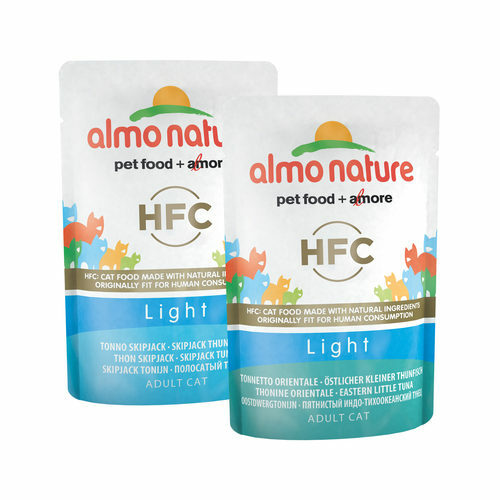 Almo Nature HFC - Light is comes in 24 pouches of 55 grams and is available in 2 flavours. Have you used Almo Nature HFC- Light before? Let us know what you think about this product.